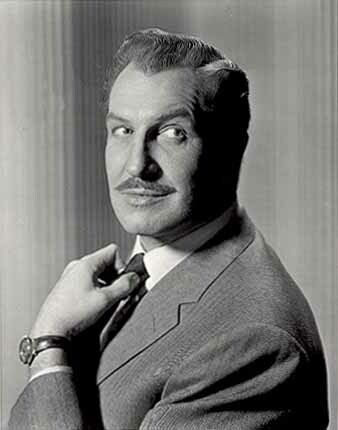 I can’t say when I first became aware of Vincent Price. He was a presence in my life from the very beginning. Horror movies, cartoon voice overs, toy commercials, TV specials, Hollywood Squares, he was everywhere. He was more than just an actor, he was also an art collector, gourmand and philanthropist. I can’t possibly do justice to the man in this small space so instead I’ll highlight some favorite roles and refer you to the excellent biography written by his daughter, Victoria Price. Vincent was born into an upper class St. Louis family in 1911, his father the president of a candy company. He attended Yale where he studied Fine Art and began appearing on stage. He transitioned to film and radio and it wasn’t long before he was a highly sought after supporting actor. He appeared in a variety of roles throughout the 1940’s but it wasn’t until 1953 that he really became a horror star with the lead role in House of Wax. In 1964 he appeared in The Last Man on Earth, the first adaptation of Richard Matheson’s I Am Legend (later remade as The Omega Man with Charlton Heston and Legend with Will Smith). Despite the low budget the Price version of the story is probably the creepiest and most memorable. You can watch the entire film for free on YouTube or via Netflix Streaming and it’s well worth watching for Price’s portrayal of the lonely and guilt ridden sole survivor on the zombie plague. As far as I know, Price never expressed any regret at being typecast in horror roles. In fact he seemed to enjoy countless appearances on game shows, talk shows and commercials that poked gentle fun at his image. Here he is on Batman, playing Egghead complete with egg shaped bald head, bad egg puns and rolling Rs. Ironically, it’s this kind of goofiness that I remember the most about Vinnie. Of course he was great in his horror roles but his fun loving side really shined when he had the chance to goof off and have fun. Who could forget his role in the epic Brady Bunch in Hawaii episode? Would you look at that? 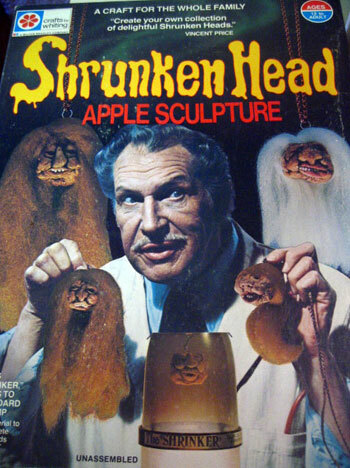 Vincent Price holding shrunken heads, along with a head shrinking machine! What kid wouldn’t want one of these? Vincent continued to work throughout the 80s, mostly in commercials, voice over roles and guest spots. His health deteriorated rapidly due to lung cancer (he was a life long smoker) and he passed away in 1993, three years after his last great role in Edward Scissorhands. He left behind an amazing legacy, both as an actor and a wonderful human being. We’ll never see anyone like him again and I for one will never forget the joy he brought so many people throughout his life.